Upcoming news, events, and available spaces. Home / Upcoming news, events, and available spaces. 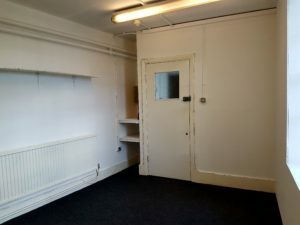 We have a lovely bright office/studio to hire out to charities or not for profit groups and organisations. It is located on the second floor, in a quiet corner and has recently had a fresh coat of paint. 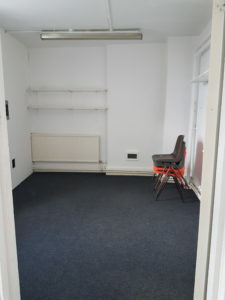 It has shelving on the walls and a small cubby area in one area and comes unfurnished, ready for the next occupant. 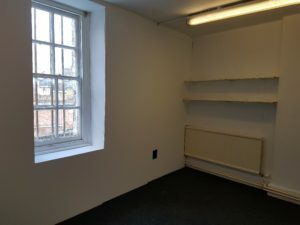 You will be based in a historic building along with other charities and not for profit groups and organisations and you will have sole use of the room on a long-term basis. If you are interested and would like to come and view, please email us at info@oldfirestation.org or phone us on 020 7254 0050.